The history of the Caribbean reveals the significant role the region played in the colonial struggles of the European powers since the 15th century. In 1492, Christopher Columbus landed in the Caribbean and claimed the region for Spain. 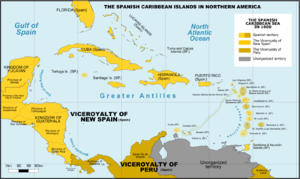 The First Spanish settlements were established in the Caribbean starting in 1493. Although the Spanish conquests of the Aztec empire and the Inca empire in the early sixteenth century made Mexico and Peru more desirable places for Spanish exploration and settlement, the Caribbean remained strategically important. Beginning in the 1620s and 1630s, non-Hispanic privateers, traders, and settlers established permanent colonies and trading posts on islands neglected by Spain. Such colonies spread throughout the Caribbean, from the Bahamas in the North West to Tobago in the South East. In addition, beginning in the 1620s, French and English buccaneers settled in places like the island of Tortuga, the northern and western coasts of Hispaniola, and later in Jamaica. After the Spanish American wars of independence in the early 19th century, only the islands of Cuba and Puerto Rico remained part of the Spanish Empire in the New World. In the 20th century the Caribbean was again important during World War II, in the decolonization wave after the war, and in the tension between Communist Cuba and the United States. Genocide, slavery, immigration, and rivalry between world powers have given Caribbean history an impact disproportionate to its size. The oldest evidence of human settlement in the Caribbean has been found at Ortoiroid sites on Trinidad dating to the mid-6th millennium BC. They had reached Hispaniola and Cuba by the mid-5th millennium BCE, where their society is also known as the . The hunter-gatherer Guanahatabey present in western Cuba at the time of Columbus’s arrival may have represented a continuation of their culture or more recent arrivals from southern Florida or the Yucatan. The islands were then repopulated by successive waves of invaders travelling south to north from initial bases in the Orinoco River valley. Between 400 and 200 BC, the Saladoid spread north from Trinidad, introducing agriculture and ceramic pottery. Sometime after AD 250, the Barrancoid followed and replaced them on Trinidad. This society’s settlements in the Orinoco collapsed around 650 and another group, the Arauquinoid (the later “Taíno” or “Arawaks“), expanded into the area and northward along the island chain. Around 1200 or 1300, a fourth group, the Mayoid (the later “Caribs“), entered Trinidad. They remained dominant until the Spanish conquest. At the time of the European arrival, three major Amerindian indigenous peoples lived on the islands: the Taíno in the Greater Antilles, The Bahamas and the Leeward Islands; the Island Caribs and Galibi in the Windward Islands; and the Ciboney in western Cuba. The Taínos are subdivided into Classic Taínos, who occupied Hispaniola and Puerto Rico, Western Taínos, who occupied Cuba, Jamaica, and the Bahamian archipelago, and the Eastern Taínos, who occupied the Leeward Islands. Trinidad was inhabited by both Carib speaking and Arawak-speaking groups. New scientific DNA studies have changed some of the traditional beliefs about pre-Columbian indigenous history. , a geneticist from the University of Puerto Rico at Mayagüez designed an island-wide DNA survey of Puerto Rico‘s people. According to conventional historical belief, Puerto Ricans have mainly Spanish ethnic origins, with some African ancestry, and distant and less significant indigenous ancestry. Cruzado’s research revealed surprising results in 2003. It found that, in fact, 61% of all Puerto Ricans have Amerindian mitochondrial DNA, 27% have African and 12% Caucasian. Soon after the voyages of Christopher Columbus to the Americas, both Portuguese and Spanish ships began claiming territories in Central and South America. These colonies brought in gold, and other European powers, most specifically England, the Netherlands, and France, hoped to establish profitable colonies of their own. Imperial rivalries made the Caribbean a contested area during European wars for centuries. In the Spanish American wars of independence in the early nineteenth century, most of Spanish America broke away from the Spanish Empire, but Cuba and Puerto Rico remained under the Spanish crown until the Spanish–American War of 1898. The Piazza (or main square) in central Havana, Cuba, in 1762, during the Seven Years’ War. During the first voyage of the explorer Christopher Columbus contact was made with the Lucayans in the Bahamas and the Taíno in Cuba and the northern coast of Hispaniola, and a few of the native people were taken back to Spain. Small amounts of gold were found in their personal ornaments and other objects such as masks and belts. The Spanish, who came seeking wealth, enslaved the native population and rapidly drove them to near-extinction. To supplement the Amerindian labor, the Spanish imported African slaves. (See also Slavery in the Spanish New World colonies.) Although Spain claimed the entire Caribbean, they settled only the larger islands of Hispaniola (1493), Puerto Rico (1508), Jamaica (1509), Cuba (1511), and Trinidad (1530). The Spanish made an exception in the case of the small ‘pearl islands’ of Cubagua and Margarita off the Venezuelan coast because of their valuable pearl beds, which were worked extensively between 1508 and 1530. The other European powers established a presence in the Caribbean after the Spanish Empire declined, partly due to the reduced native population of the area from European diseases. The Dutch, the French, and the British followed one another to the region and established a long-term presence. They brought with them millions of slaves imported from Africa to support the tropical plantation system that spread through the Caribbean islands. Francis Drake was an English privateer who attacked many Spanish settlements. His most celebrated Caribbean exploit was the capture of the Spanish Silver Train at Nombre de Dios in March, 1573. British colonization of Bermuda began in 1612. British West Indian colonisation began with St. Kitts in 1623 and Barbados in 1627. The former was used as a base for British colonisation of neighbouring Nevis (1628), Antigua (1632), Montserrat (1632), Anguilla (1650) and Tortola (1672). French colonization too began on St. Kitts, the British and the French splitting the island amongst themselves in 1625. It was used as a base to colonise the much larger Guadeloupe (1635) and Martinique (1635), St. Martin (1648), St Barts (1648), and St Croix (1650), but was lost completely to Britain in 1713. From Martinique the French colonised St. Lucia (1643), Grenada (1649), Dominica (1715), and St. Vincent (1719). The English admiral William Penn seized Jamaica in 1655 and it remained under British rule for over 300 years. Piracy in the Caribbean was widespread during the early colonial era, especially between 1640 and 1680. The term “buccaneer” is often used to describe a pirate operating in this region. In 1625 French buccaneers established a settlement on Tortuga, just to the north of Hispaniola, that the Spanish were never able to permanently destroy despite several attempts. The settlement on Tortuga was officially established in 1659 under the commission of King Louis XIV. In 1670 Cap François (later Cap Français, now Cap-Haïtien) was established on the mainland of Hispaniola. Under the 1697 Treaty of Ryswick, Spain officially ceded the western third of Hispaniola to France. The Dutch took over Saba, Saint Martin, Sint Eustatius, Curaçao, Bonaire, Aruba, Tobago, St. Croix, Tortola, Anegada, Virgin Gorda, Anguilla and a short time Puerto Rico, together called the Dutch West Indies, in the 17th century. Denmark-Norway first ruled part, then all of the present U.S. Virgin Islands since 1672, Denmark sold sovereignty over the Danish West Indies in 1917 to the United States, which still administers them. During the first three-quarters of the sixteenth century, matters of balance of power and dynastic succession weighed heavily on the course of European diplomacy and war. Europe’s largest and most powerful kingdoms, France and Spain, were the continent’s staunchest rivals. Tensions increased after 1516, when the kingdoms of Castile, León, and Aragon were formally unified under Charles I of Spain, who three years later expanded his domains after his election as Holy Roman Emperor and began to surround France. In 1521, France went to war with the Holy Roman Empire. Spanish troops routed French armies in France, the Italian Peninsula, and elsewhere, forcing the French Crown to surrender in 1526 and again in 1529. The Italian Wars, as the French-Spanish wars came to be known, reignited in 1536 and again in 1542. Intermittent warring between the Valois monarchy and the Habsburg Empire continued until 1559. French corsair attacks began in the early 1520s, as soon as France declared war on Spain in 1521. At the time, prodigious treasures from Mexico began to cross the Atlantic en route to Spain. French monarch Francis I challenged Spain’s exclusivist claims to the New World and its wealth, demanding to see “the clause in Adam’s will which excluded me from my share when the world was being divided.” Giovanni da Verrazzano (aka Jean Florin) led the first recorded French corsair attack against Spanish vessels carrying treasures from the New World. In 1523, off the Cape of St. Vincent, Portugal, his vessels captured two Spanish ships laden with a fabulous treasure consisting of 70,000 ducats worth of gold, large quantities of silver and pearls, and 25,000 pounds of sugar, a much-treasured commodity at the time. The first recorded incursion in the Caribbean happened in 1528, when a lone French corsair vessel appeared off the coast of Santo Domingo and its crew sacked the village of San Germán on the western coast of Puerto Rico. In the mid-1530s, corsairs, some Catholic but most of them Protestant (Huguenot), began routinely attacking Spanish vessels and raiding Caribbean ports and coastal towns; the most coveted were Santo Domingo, Havana, Santiago, and San Germán. Corsair port raids in Cuba and elsewhere in the region usually followed the rescate (ransom) model, whereby the aggressors seized villages and cities, kidnapped local residents, and demanded payment for their release. If there were no hostages, corsairs demanded ransoms in exchange for sparing towns from destruction. Whether ransoms were paid or not, corsairs looted, committed unspeakable violence against their victims, desecrated churches and holy images, and left smoldering reminders of their incursions. In 1536, France and Spain went to war again and French corsairs launched a series of attacks on Spanish Caribbean settlements and ships. The next year, a corsair vessel appeared in Havana and demanded a 700-ducat rescate. Spanish men-of-war arrived soon and scared off the intruding vessel, which returned soon thereafter to demand yet another rescate. Santiago was also victim of an attack that year, and both cities endured raids yet again in 1538. The waters off Cuba’s northwest became particularly attractive to pirates as commercial vessels returning to Spain had to squeeze through the 90-mile-long strait between Key West and Havana. In 1537–1538, corsairs captured and sacked nine Spanish vessels. While France and Spain were at peace until 1542, beyond-the-line corsair activity continued. When war erupted again, it echoed once more in the Caribbean. A particularly vicious French corsair attack took place in Havana in 1543. It left a gory toll of 200 killed Spanish settlers. In all, between 1535 and 1563, French corsairs carried out around sixty attacks against Spanish settlements and captured over seventeen Spanish vessels in the region (1536–1547). While Frenchmen and Spaniards fought one another in Europe and the Caribbean, England sided with Spain, largely because of dynastic alliances. In 1509, Prince Henry of England married Princess Catherine of Aragon and soon thereafter they were crowned king and queen. It was a tortuous marriage, to say the least, and Henry VIII began to separate from Catherine in 1527. When Pope Clement VII refused to annul the marriage, Henry VIII pushed the English Catholic Church to separate from Rome and become the Church of England, free from the pope’s authority. Following Henry VIII’s death in 1547, yet another Anglo-Spanish dynastic marriage was arranged, this time between Spain’s Prince Phillip and Queen Mary I, the Catholic daughter of Anglican Henry VIII. During their brief reign, the Church of England was again subject to the pope’s authority. When Mary I died in 1558, Phillip II ceased to be king of England and England broke from Rome again. Her successor, Elizabeth, actually rejected a plan to continue the Anglo-Spanish dynastic union when she refused to consider marrying Philip; she was to remain virgin and Protestant. As Protestantism spread further in European kingdoms such as England and France and it became predominant in other formerly Catholic nations, religious antagonisms played an increasingly important role in determining war and peace among the nations of Europe. Tensions increased between England and Spain, particularly following the ascent of Anglican Queen Elizabeth to the throne in 1558. The new English monarch’s anti-Catholic zeal mirrored Philip II’s trenchant hatred of the Protestant faith. Protestantism also spread in France and throughout parts of the Holy Roman Empire. By the mid-1560s, two discernible opposing blocs had taken shape: a southern European Catholic bloc led by Spain and a northern European bloc led by England. One of the most valuable ideological weapons of the Reformation and wars against Catholic Spain was the “Black Legend,” the systematic denigration of Spain and its people, culture, and religion. Largely fed by the works of Bartolomé de las Casas, English and Dutch Protestants portrayed Spaniards as backward, dishonest, fanatical, cruel, and lazy. Dutch, English, and German editions of las Casas’ Brief Account of the Destruction of the Indies circulated throughout Europe beginning in 1578 with titles such as “Spanish cruelties and tyrannies.” Theodore De Bry, a Protestant, edited, illustrated, and published editions of las Casas’ book and others on related topics and included gruesome engravings depicting Spanish cruelty. Spain’s relations with England further soured upon the crowning of Elizabeth in 1558. She openly supported the Dutch insurrection and aided Huguenot forces in France. After decades of increasing tensions and confrontations in the northern Atlantic and the Caribbean, Anglo-Spanish hostilities broke out in 1585, when the English Crown dispatched over 7,000 troops to the Netherlands and Queen Elizabeth liberally granted licenses for privateers to carry out piracy against Spain’s Caribbean possessions and vessels. Tensions further intensified in 1587, when Elizabeth I ordered the execution of Catholic Mary Queen of Scotts after twenty years of captivity and gave the order for a preemptive attack against the Spanish Armada stationed in Cadiz. In retaliation, Spain organized the famous naval attack that ended tragically for Spain with the destruction of the “invincible” Armada in 1588. Spain rebuilt its naval forces, largely with galleons built in Havana, and continued to fight England until Elizabeth’s death in 1603. Spain, however, had received a near-fatal blow that ended its standing as Europe’s most powerful nation and virtually undisputed master of the Indies. Following the Franco-Spanish peace treaty of 1559, crown-sanctioned French corsair activities subsided, but piratical Huguenot incursions persisted and in at least one instance led to the formation of a temporary Huguenot settlement in the Isle of Pines, off Cuba. English piracy increased during the reign of Charles I, King of England, Scotland, and Ireland (1625–1649) and became more aggressive as Anglo-Spanish relations tensed up further during the Thirty Years’ War. Although Spain and the Netherlands had been at war since the 1560s, the Dutch were latecomers, appearing in the region only after the mid-1590s, when the Dutch Republic was no longer on the defensive in its long conflict against Spain. Dutch privateering became more widespread and violent beginning in the 1620s. English incursions in the Spanish-claimed Caribbean boomed during Queen Elizabeth’s rule. These actions originally took the guise of well-organized, large-scale smuggling expeditions headed by piratical smugglers the likes of John Hawkins, John Oxenham, and Francis Drake; their primary objectives were smuggling African slaves into Spain’s Caribbean possessions in exchange for tropical products. The first instances of English mercantile piracy took place in 1562–63, when Hawkins’ men raided a Portuguese vessel off the coast of Sierra Leone, captured the 300 slaves on board, and smuggled them into Santo Domingo in exchange for sugar, hides, and precious woods. Hawkins and his contemporaries mastered the devilish art of maximizing the number of slaves that could fit into a ship. He and other slave traders methodically packed slaves by having them lay on their sides, spooned against one another. Such was the case of the slave-trading vessel bearing the sub-lime name Jesus of Lübeck, into whose pestilent bowels, in partnership with Elizabeth I, Hawkins jammed 400 African slaves. In 1567 and 1568, Hawkins commanded two piratical smuggling expeditions, the last of which ended disastrously; he lost almost all of his ships and three-fourths of his men were killed by Spanish soldiers at San Juan de Ulúa, off the coast of Veracruz, the point of departure of the fleet of New Spain. Hawkins and Drake barely escaped but Oxenham was captured, convicted of heresy by the Inquisition and burned alive. Many of the battles of the Anglo-Spanish war were fought in the Caribbean, not by regular English troops but rather by privateers whom Queen Elizabeth had licensed to carry out attacks on Spanish vessels and ports. These were former pirates who now held a more venerable status as privateers. During those years, over seventy-five documented English privateering expeditions targeted Spanish possessions and vessels. Drake terrorized Spanish vessels and ports. Early in 1586, his forces seized Santo Domingo, retaining control over it for around a month. Before departing they plundered and destroyed the city, taking a huge bounty. Drake’s men destroyed church images and ornaments and even erected a defensive palisade with wooden images of saints in the hope that the Spanish soldiers’ Catholic fervor would keep them from firing saints as human shields of sorts. A 19th-century lithograph by Theodore Bray showing a sugarcane plantation. On right is “white officer”, the European overseer, watching plantation workers. To the left is a flat-bottomed vessel for cane transportation. The slaves brought to the Caribbean lived in inhumane conditions. Above are examples of slave huts in Bonaire provided by Dutch colonialists. About 5 feet tall and 6 feet wide, between 2 and 3 slaves slept in these after working in nearby salt mines. The development of agriculture in the Caribbean required a large workforce of manual labourers, which the Europeans found by taking advantage of the slave trade in Africa. The Atlantic slave trade brought African slaves to British, Dutch, French, Portuguese and Spanish colonies in the Americas, including the Caribbean. Slaves were brought to the Caribbean from the early 16th century until the end of the 19th century. The majority of slaves were brought to the Caribbean colonies between 1701 and 1810. Also in 1816 there was a slave revolution in the colony of Barbados. Abolitionists in the Americas and in Europe became vocal opponents of the slave trade throughout the 19th century. The importation of slaves to the colonies was often outlawed years before the end of the institution of slavery itself. It was well into the 19th century before many slaves in the Caribbean were legally free. The trade in slaves was abolished in the British Empire through the Abolition of the Slave Trade Act in 1807. Men, women and children who were already enslaved in the British Empire remained slaves, however, until Britain passed the Slavery Abolition Act in 1833. When the Slavery Abolition Act came into force in 1834, roughly 700,000 slaves in the British West Indies immediately became free; other enslaved workers were freed several years later after a period of forced apprenticeship. Slavery was abolished in the Dutch Empire in 1814. Spain abolished slavery in its empire in 1811, with the exceptions of Cuba, Puerto Rico, and Santo Domingo; Spain ended the slave trade to these colonies in 1817, after being paid ₤400,000 by Britain. Slavery itself was not abolished in Cuba until 1886. France abolished slavery in its colonies in 1848. European plantations required laws to regulate the plantation system and the many slaves imported to work on the plantations. This legal control was the most oppressive for slaves inhabiting colonies where they outnumbered their European masters and where rebellion was persistent such as Jamaica. During the early colonial period, rebellious slaves were harshly punished, with sentences including death by torture; less serious crimes such as assault, theft, or persistent escape attempts were commonly punished with mutilations, such as the cutting off of a hand or a foot. Under British rule, slaves could only be freed with the consent of their master, and therefore freedom for slaves was rare. British colonies were able to establish laws through their own legislatures, and the assent of the local island governor and the Crown. British law considered slaves to be property, and thus did not recognize marriage for slaves, family rights, education for slaves, or the right to religious practices such as holidays. British law denied all rights to freed slaves, with the exception of the right to a jury trial. Otherwise, freed slaves had no right to own property, vote or hold office, or even enter some trades. The French Empire regulated slaves under the Code Noir (Black Code) which was in force throughout the empire, but which was based upon French practices in the Caribbean colonies. French law recognized slave marriages, but only with the consent of the master. French law, like Spanish law, gave legal recognition to marriages between European men and black or Creole women. French and Spanish laws were also significantly more lenient than British law in recognizing manumission, or the ability of a slave to purchase their freedom and become a “freeman”. Under French law, free slaves gained full rights to citizenship. The French also extended limited legal rights to slaves, for example the right to own property, and the right to enter contracts. The exploitation of the Caribbean landscape dates back to the Spanish conquistadors starting in the 1490s, who forced indigenous peoples held by Spanish settlers in encomienda to mine for gold. The more significant development came when Christopher Columbus wrote back to Spain that the islands were made for sugar development. The history of Caribbean agricultural dependency is closely linked with European colonialism which altered the financial potential of the region by introducing a plantation system. Much like the Spanish exploited indigenous labor to mine gold, the 17th century brought a new series of oppressors in the form of the Dutch, the English, and the French. By the middle of the 18th century sugar was Britain’s largest import which made the Caribbean that much more important as a colony. Sugar was a luxury in Europe prior to the 18th century. It became widely popular in the 18th century, then graduated to becoming a necessity in the 19th century. This evolution of taste and demand for sugar as an essential food ingredient unleashed major economic and social changes. Caribbean islands with plentiful sunshine, abundant rainfalls and no extended frosts were well suited for sugarcane agriculture and sugar factories. Following the emancipation of slaves in 1833 in the United Kingdom, many liberated Africans left their former masters. This created an economic chaos for British owners of Caribbean sugar cane plantations. The hard work in hot, humid farms required a regular, docile and low-waged labour force. The British looked for cheap labour. This they found initially in China and then mostly in India. The British crafted a new legal system of forced labour, which in many ways resembled enslavement. Instead of calling them slaves, they were called indentured labour. 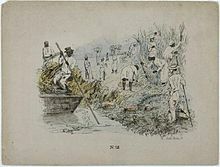 Indians and southeast Asians began to replace Africans previously brought as slaves, under this indentured labour scheme to serve on sugarcane plantations across the British empire. The first ships carrying indentured labourers for sugarcane plantations left India in 1836. Over the next 70 years, numerous more ships brought indentured labourers to the Caribbean, as cheap and docile labor for harsh inhumane work. The slave labor and indentured labor – both in millions of people – were brought into Caribbean, as in other European colonies throughout the world. Cane cutters in Jamaica, 1880s. The New World plantations were established in order to fulfill the growing needs of the Old World. The sugar plantations were built with the intention of exporting the sugar back to Britain which is why the British did not need to stimulate local demand for the sugar with wages. [dubious – discuss][further explanation needed] A system of slavery was adapted since it allowed the colonizer to have an abundant work force with little worry about declining demands for sugar. In the 19th century wages were finally introduced with the abolition of slavery. The new system in place however was similar to the previous as it was based on white capital and colored labor. Large numbers of unskilled workers were hired to perform repeated tasks, which made if very difficult for these workers to ever leave and pursue any non farming employment. Unlike other countries, where there was an urban option for finding work, the Caribbean countries had money invested in agriculture and lacked any core industrial base. The cities that did exist offered limited opportunities to citizens and almost none for the unskilled masses who had worked in agriculture their entire lives. The products produced brought in no profits for the countries since they were sold to the colonial occupant buyer who controlled the price the products were sold at. This resulted in extremely low wages with no potential for growth since the occupant nations had no intention of selling the products at a higher price to themselves. The result of this economic exploitation was a plantation dependence which saw the Caribbean nations possessing a large quantity of unskilled workers capable of performing agricultural tasks and not much else. After many years of colonial rule the nations also saw no profits brought into their country since the sugar production was controlled by the colonial rulers. This left the Caribbean nations with little capital to invest towards enhancing any future industries unlike European nations which were developing rapidly and separating themselves technologically and economically from most impoverished nations of the world. Battle of the Saintes by Thomas Mitchell. This 1782 battle between the British and French navies took place near Guadeloupe. The Caribbean region was war-torn throughout much of colonial history, but the wars were often based in Europe, with only minor battles fought in the Caribbean. Some wars, however, were borne of political turmoil in the Caribbean itself. Thirty Years’ War between the Netherlands and Spain. The First, Second, and Third Anglo-Dutch Wars were battles for supremacy. Nine Years’ War between the European powers. The War of Spanish Succession (European name) or Queen Anne’s War (American name) spawned a generation of some of the most infamous pirates. The War of Jenkins’ Ear (American name) or The War of Austrian Succession (European name) Spain and Britain fought over trade rights; Britain invaded Spanish Florida and attacked the citadel of Cartagena de Indias in present-day Colombia. The Seven Years’ War (European name) or the French and Indian War (American name) was the first “world war” between France, her ally Spain, and Britain; France was defeated and was willing to give up all of Canada to keep a few highly profitable sugar-growing islands in the Caribbean. Britain seized Havana toward the end, and traded that single city for all of Florida at the Treaty of Paris in 1763. In addition France ceded Grenada, Dominica, and Saint Vincent (island) to Britain. The American Revolution saw large British and French fleets battling in the Caribbean again. American independence was assured by French naval victories in the Caribbean, but all the British islands that were captured by the French were returned to Britain at the end of the war. The French Revolutionary War enabled the creation of the newly independent Republic of Haiti. In addition, in the Treaty of Amiens in 1802, Spain ceded Trinidad to Britain. Following the end of the Napoleonic War in 1814 France ceded Saint Lucia to Britain. The Spanish–American War ended Spanish control of Cuba (which soon became independent) and Puerto Rico (which became a US colony), and heralded the period of American dominance of the islands. Piracy in the Caribbean was often a tool used by the European empires to wage war unofficially against one another. Gold plundered from Spanish ships and brought to Britain had a pivotal effect on European interest in colonizing the region. Illustration circa 1815 showing “Incendie du Cap” (Burning of Cape Francais) during the Haitian Revolution. The caption reads: “General revolt of the Blacks. Massacre of the Whites”. The plantation system and the slave trade that enabled its growth led to regular slave resistance in many Caribbean islands throughout the colonial era. Resistance was made by escaping from the plantations altogether, and seeking refuge in the areas free of European settlement. Communities of escaped slaves, who were known as Maroons, banded together in heavily forested and mountainous areas of the Greater Antilles and some of the islands of the Lesser Antilles. The spread of the plantations and European settlement often meant the end of many Maroon communities, although they survived on Saint Vincent and Dominica, and in the more remote mountainous areas of Jamaica, Hispaniola, Guadeloupe and Cuba. Violent resistance broke out periodically on the larger Caribbean islands. Many more conspiracies intended to create rebellions were discovered and ended by Europeans before they could materialize. Actual violent uprisings, involving anywhere from dozens to thousands of slaves, were regular events, however. Jamaica and Cuba in particular had many slave uprisings. Such uprisings were brutally crushed by European forces. Map of Antilles / Caribbean in 1843. Haiti, the former French colony of Saint-Domingue on Hispaniola, was the first Caribbean nation to gain independence from European powers in 1804. This followed 13 years of war that started as a slave uprising in 1791 and quickly turned into the Haitian Revolution under the leadership of Toussaint l’Ouverture, where the former slaves defeated the French army (twice), the Spanish army, and the British army, before becoming the world’s first and oldest black republic, and also the second-oldest republic in the Western Hemisphere after the United States. This is additionally notable as being the only successful slave uprising in history. The remaining two-thirds of Hispaniola were conquered by Haitian forces in 1821. In 1844, the newly formed Dominican Republic declared its independence from Haiti. The nations bordering the Caribbean in Central America gained independence with the 1821 establishment of the First Mexican Empire—which at that time included the modern states of Mexico, Guatemala, El Salvador, Honduras, Nicaragua, and Costa Rica. The nations bordering the Caribbean in South America also gained independence from Spain in 1821 with the establishment of Gran Colombia—which comprised the modern states of Venezuela, Colombia, Ecuador, and Panama. Cuba and Puerto Rico remained as Spanish colonies until the Spanish–American War in 1898, after which Cuba attained its independence in 1902, and Puerto Rico became an unincorporated territory of the United States, being the last of the Greater Antilles under colonial control. Between 1958 and 1962 most of the British-controlled Caribbean was integrated as the new West Indies Federation in an attempt to create a single unified future independent state—but it failed. The following former British Caribbean island colonies achieved independence in their own right; Jamaica (1962), Trinidad & Tobago (1962), Barbados (1966), Bahamas (1973), Grenada (1974), Dominica (1978), St. Lucia (1979), St. Vincent (1979), Antigua & Barbuda (1981), St. Kitts & Nevis (1983). In addition British Honduras in Central America became independent as Belize (1981), British Guiana in South America became independent as Guyana (1966), and Dutch Guiana also in South America became independent as Suriname (1975). A carriage on a street in Martinique, one of the Caribbean islands that has not become independent. It is an overseas region of France, and its citizens are full French citizens. It should be noted that as of the early 21st century, not all Caribbean islands have become independent. Several islands continue to have government ties with European countries, or with the United States. French overseas departments and territories include several Caribbean islands. Guadeloupe and Martinique are French overseas regions, a legal status that they have had since 1946. Their citizens are considered full French citizens with the same legal rights. In 2003, the populations of St. Martin and St. Barthélemy voted in favour of secession from Guadeloupe in order to form separate overseas collectivities of France. After a bill was passed in the French Parliament, the new status took effect on 22 February 2007. Puerto Rico and the U.S. Virgin Islands are officially territories of the United States, but are sometimes referred to as “protectorates” of the United States. They are self governing territories subject to Congress plenary powers over the territories. Aruba, Curaçao, and Sint Maarten are all presently separate constituent countries, formerly part of the Netherlands Antilles. Along with Netherlands, they form the four constituent countries of the Kingdom of the Netherlands. Citizens of these islands have full Dutch citizenship. United States’ rescue effort at St. Vincent, 1902, following an eruption of the volcano at La Soufrière. Since the Monroe Doctrine, the United States gained a major influence on most Caribbean nations. In the early part of the twentieth century this influence was extended by participation in The Banana Wars. Areas outside British or French control became known in Europe as “America’s tropical empire”. Victory in the Spanish–American War and the signing of the Platt amendment in 1901 ensured that the United States would have the right to interfere in Cuban political and economic affairs, militarily if necessary. After the Cuban revolution of 1959 relations deteriorated rapidly leading to the Bay of Pigs Invasion, the Cuban Missile Crisis and successive US attempts to destabilise the island. The US invaded and occupied Hispaniola (present day Dominican Republic and Haiti) for 19 years (1915–34), subsequently dominating the Haitian economy through aid and loan repayments. The United States invaded Haiti again in 1994 and in 2004 were accused by CARICOM of arranging a coup d’état to remove elected Haitian leader Jean-Bertrand Aristide. In 1965, 23,000 U.S. troops landed in the Dominican Republic to quash a military coup in what was the first U.S. military intervention in Latin America in more than 30 years. President Lyndon Johnson had ordered the invasion to stem what he claimed to be a “Communist threat”, but the mission appeared ambiguous and was condemned throughout the hemisphere as a return to gunboat diplomacy. In 1983 the United States invaded Grenada to remove populist left-wing leader Maurice Bishop. The United States maintains a naval military base in Cuba at Guantanamo Bay. The base is one of five unified commands whose “area of responsibility” is Latin America and the Caribbean. The command is headquartered in Miami, Florida. As an arm of the economic and political network of the Americas, the influence of the United States stretches beyond a military context. In economic terms, the United States represents a primary market for the export of Caribbean goods. Notably, this is a recent historical trend. The post-war era reflects a time of transition for the Caribbean basin when, as colonial powers sought to disentangle from the region (as part of a larger trend of decolonization), the US began to expand its hegemony throughout the region. This pattern is confirmed by economic initiatives such as the Caribbean Basin Initiative (CBI), which sought to congeal alliances with the region in light of a perceived Soviet threat. The CBI marks the emergence of the Caribbean basin as a geopolitical area of strategic interest to the US. This relationship has carried through to the 21st century, as reflected by the Caribbean Basin Trade Partnership Act. The Caribbean Basin is also of strategic interest in regards to trade routes; it has been estimated that nearly half of US foreign cargo and crude oil imports are brought via Caribbean seaways. During wartime, these figures only stand to increase. It is important to note that the United States is also of strategic interest to the Caribbean. Caribbean foreign policy seeks to strengthen its participation in a global free market economy. As an extension of this, Caribbean states do not wish to be excluded from their primary market in the United States, or be bypassed in the creation of “wider hemispheric trading blocs” that stand to drastically alter trade and production in the Caribbean Basin. As such, the US has played an influential role in shaping the Caribbean’s role in this hemispheric market. Likewise, building trade relationships with the US has always figured in strongly with the political goal of economic security in post-independence Caribbean states. The mainstay of the Caribbean economy, sugar, has declined gradually since the beginning of the 20th century, although it is still a major crop in the region. Caribbean sugar production became relatively expensive in comparison to other parts of the world that developed their own sugar cultivation industries, making it difficult for Caribbean sugar products to compete. Caribbean economic diversification into new activities became essential to the islands. A 1906 advertisement in the Montreal Medical Journal, showing the United Fruit Company selling trips to Jamaica. By the beginning of the 20th century, the Caribbean islands enjoyed greater political stability. Large-scale violence was no longer a threat after the end of slavery in the islands. The British-controlled islands in particular benefited from investments in the infrastructure of colonies. By the beginning of World War I, all British-controlled islands had their own police force, fire department, doctors and at least one hospital. Sewage systems and public water supplies were built, and death rates in the islands dropped sharply. Literacy also increased significantly during this period, as schools were set up for students descended from African slaves. Public libraries were established in large towns and capital cities. These improvements in the quality of life for the inhabitants also made the islands a much more attractive destination for visitors. Tourists began to visit the Caribbean in larger numbers by the beginning of the 20th century, although there was a tourist presence in the region as early as the 1880s. The U.S.-owned United Fruit Company operated a fleet of “banana boats” in the region that doubled as tourist transportation. The United Fruit Company also developed hotels for tourist accommodations. It soon became apparent, however, that this industry was much like a new form of colonialism; the hotels operated by the company were fully staffed by Americans, from chefs to waitresses, in addition to being owned by Americans, so that the local populations saw little economic benefit. The company also enforced racial discrimination in many policies for its fleet. Black passengers were assigned to inferior cabins, were sometimes denied bookings, and were expected to eat meals early before white passengers. The most popular early destinations were Jamaica and the Bahamas; the Bahamas remains today the most popular tourist destination in the Caribbean. Post-independence economic needs, particularly in the aftermath of the end of preferential agricultural trade ties with Europe, led to a boom in the development of the tourism industry in the 1980s and thereafter. Large luxury hotels and resorts have been built by foreign investors in many of the islands. Cruise ships are also regular visitors to the Caribbean. Some islands have gone against this trend, such as Cuba and Haiti, whose governments chose not to pursue foreign tourism, although Cuba has developed this part of the economy very recently. Other islands lacking sandy beaches, such as Dominica, missed out on the 20th-century tourism boom, although they have recently begun to develop eco-tourism, diversifying the tourism industry in the Caribbean. The development of offshore banking services began during the 1920s. The close proximity of the Caribbean islands to the United States has made them an attractive location for branches of foreign banks. Clients from the United States take advantage of offshore banking services to avoid U.S. taxation. The Bahamas entered the financial services industry first, and continues to be at the forefront of financial services in the region. The Cayman Islands, the British Virgin Islands, and the Netherlands Antilles have also developed competitive financial services industries. A container ship docked in the deep water harbour of Bridgetown, Barbados, which opened in 1961. Ports both large and small were built throughout the Caribbean during the colonial era. The export of sugar on a large scale made the Caribbean one of the world’s shipping cornerstones, as it remains today. Many key shipping routes still pass through the region. The development of large-scale shipping to compete with other ports in Central and South America ran into several obstacles during the 20th century. Economies of scale, high port handling charges, and a reluctance by Caribbean governments to privatize ports put Caribbean shipping at a disadvantage. Many locations in the Caribbean are suitable for the construction of deepwater ports for commercial ship container traffic, or to accommodate large cruise ships. The deepwater port at Bridgetown, Barbados, was completed by British investors in 1961. A more recent deepwater port project was completed by Hong Kong investors in Grand Bahama in the Bahamas. Some Caribbean islands take advantage of flag of convenience policies followed by foreign merchant fleets, registering the ships in Caribbean ports. The registry of ships at “flag of convenience” ports is protected by the Law of the Sea and other international treaties. These treaties leave the enforcement of labour, tax, health and safety, and environmental laws under the control of the registry, or “flag” country, which in practical terms means that such regulations seldom result in penalties against the merchant ship. The Cayman Islands, Bahamas, Antigua, Bermuda, and St. Vincent are among the top 11 flags of convenience in the world. However, the flag of convenience practice has been a disadvantage to Caribbean islands as well, since it also applies to cruise ships, which register outside the Caribbean and thus can evade Caribbean enforcement of the same territorial laws and regulations. ^ Rouse, Irving. The Tainos: Rise and Decline of the People who Greeted Columbus, p. 63. New Haven: Yale University Press, 1992. ISBN 978-0-300-05181-0. ^ Saunders, Nicholas. The Peoples of the Caribbean: an Encyclopedia of Archeology and Traditional Culture, p. 13. ABC-CLIO, 2005. ISBN 978-1-57607-701-6. ^ “History of the Caribbean”. www.caribbeanhouserecords.com. Retrieved 2018-08-13. ^ Rouse, Irving. The Tainos : Rise and Decline of the People Who Greeted Columbus ISBN 0-300-05696-6. ^ Kearns, Rick (Jun 2003 – Jun 2004). “Indigenous Puerto Rico: DNA evidence upsets established history”. Issues in Caribbean Amerindian Studies. V (2). Archived from the original on March 2, 2012. Retrieved March 3, 2012. ^ Molly Warsh, American Baroque: Pearls and the Nature of Empire, 1492-1700. Chapel Hill: University of North Carolina Press 2018. ^ “History”. The government of the Cayman Islands. 2009. Archived from the original on 2006-04-27. Retrieved 2009-05-07. ^ “Hispaniola”. Encyclopædia Britannica. Retrieved 4 January 2014. ^ Haggerty, Richard A. (1989). “Haiti, A Country Study: French Settlement and Sovereignty”. US Library of Congress. Retrieved 2009-03-30. ^ a b c d e f g h i j k Martínez-Fernández, Luis (7 May 2015). “Far beyond the Line: Corsairs, Privateers, Buccaneers, and Invading Settlers in Cuba and the Caribbean (1529-1670)”. Revista de Indias. 75 (263): 7–38. doi:10.3989/revindias.2015.002. Material was copied from this source, which is available under a Creative Commons Attribution 4.0 International License. ^ King, Russell (2010). People on the Move: An Atlas of Migration. Berkeley, Los Angeles: University of California Press. p. 24. ISBN 0-520-26151-8. ^ Bush, Barbara (1990), Slave Women in Caribbean Society: 1650–1838, Bloomington, Ind. : Indiana University Press (ISBN 0-85255-057-X & 0-253-21251-0), p. 98. ^ a b c d e f Bush (1990), Slave Women in Caribbean Society, p. 108. ^ Morrissey, Marietta (1989), Slave Women in the New World: Gender Stratification in the Caribbean, Lawrence, Kans. : University Press of Kansas (ISBN 0-7006-0394-8), p. 85 and see p. 99 (author assoc. prof. sociology, Univ. of Toledo). ^ a b c Bush (1990), Slave Women in Caribbean Society, p. 109. ^ Bush (1990), Slave Women in Caribbean Society, p. 109. ^ Morrissey (1989), Slave Women in the New World, p. 89. ^ a b Rogozinski, Jan (2000). A Brief History of the Caribbean. London: Penguin. pp. 132–3. ISBN 978-0-452-28193-6. ^ Rogozinski (2000). A Brief History of the Caribbean. p. 133. ^ Cross, Malcolm (1979), Urbanization and Urban Growth in the Caribbean, New York: Cambridge University Press, p. 114. ^ Cross (1979), Urbanization and Urban Growth in the Caribbean, p. 3. ^ “Forced Labour”. The National Archives, Government of the United Kingdom. 2010. ^ “St. Lucia’s Indian Arrival Day”. Caribbean Repeating Islands. 2009. ^ “Indian indentured labourers”. The National Archives, Government of the United Kingdom. 2010. ^ Cross (1979), Urbanization and Urban Growth in the Caribbean, p. 5. ^ Cross (1979), Urbanization and Urban Growth in the Caribbean, p. 23. ^ Cross (1979), Urbanization and Urban Growth in the Caribbean, p. 27. ^ Cross (1979), Urbanization and Urban Growth in the Caribbean, p. 28. ^ Rogozinski (2000). A Brief History of the Caribbean. pp. 159–160. ^ a b Rogozinski (2000). A Brief History of the Caribbean. pp. 161–3. ^ Gleijeses, Piero (28 October 2011). “The United States Invasion of the Dominican Republic, 1961–1966”. Oxford Bibliographies Online. doi:10.1093/OBO/9780199766581-0071. Retrieved 1 February 2018. ^ “U.S. troops land in the Dominican Republic”. History.com. 2009. Retrieved 1 February 2018. ^ Rogozinski (2000). A Brief History of the Caribbean. p. 349. ^ Rogozinski (2000). A Brief History of the Caribbean. p. 197. ^ Duval, David Timothy (2004). Tourism in the Caribbean: trends, development, prospects. Psychology Press. p. 153. ISBN 978-0-415-30362-0. ^ Rogozinski (2000). A Brief History of the Caribbean. pp. 343–344. ^ Duval, David Timothy (2004). Tourism in the Caribbean: Trends, Development, Prospects. Psychology Press. p. 160. ISBN 978-0-415-30362-0. Altman, Ida. “The Revolt of Enriquillo and the Historiography of Early Spanish America,” The Americas vol. 63(4)2007, 587-614. Altman, Ida. “Marriage, Family, and Ethnicity in the Early Spanish Caribbean,” William and Mary Quarterly, 3rd ser. 70:2(2013):226-250. Altman, Ida.”Key to the Indies: Port Cities in the Spanish Caribbean: 1493-1550.” The Americas 74:1(Jan. 2017):5-26. Anderson-Córdova, Karen F. Surviving Spanish Conquest: Indian Fight, Flight, and Cultural Transformation in Hispaniola and Puerto Rico. Tuscaloosa: University of Alabama Press 2017. Andrews, Kenneth R. The Spanish Caribbean: Trade and Plunder, 1530-1630. New Haven: Yale University Press 1978. Cox, Edward Godfrey (1938). “West Indies”. Reference Guide to the Literature of Travel. 2: New World. Seattle: University of Washington – via Hathi Trust. de Kadt, Emanuel (editor), 1972. Patterns of foreign influence in the Caribbean, London, New York, published for the Royal Institute of International Affairs by Oxford University Press. * Dooley Jr, Edwin L. “Wartime San Juan, Puerto Rico: The Forgotten American Home Front, 1941-1945.” Journal of Military History 63.4 (1999): 921.
. Sugar and Slaves: The Rise of the Planter Class in the English West Indies, 1624–1713 1972). Eccles, Karen E. and Debbie McCollin, eds. World War II and the Caribbean (2017) excerpt; historiography covered in the introduction. Emmer, Pieter C., ed. General History of the Caribbean. London: UNESCO Publishing 1999. Floyd, Troy S. The Columbus Dynasty in the Caribbean, 1492-1526. Albuquerque: University of New Mexico Press 1973. Hoffman, Paul E. The Spanish Crown and the Defense of the Caribbean, 1535-1585: Precedent, Patrimonialism, and Royal Parsimony. Baton Rouge: LSU Press 1980. Keegan, William F. Taíno Myth and Practice: the Arrival of the Stranger King. Gainesville: University of Florida Press 2007. Klooster, Wim, 1998. Illicit riches. Dutch trade in the Caribbean, 1648-1795, KITLV. Morse, J. (1797). “West Indies”. The American Gazetteer. Boston, Massachusetts: S. Hall, and Thomas & Andrews. Ratekin, Mervyn. “The Early Sugar Industry in Española,” Hispanic American Historical Review 34:2(1954):1-19. Rogozinski, Jan. A Brief History of the Caribbean (2000). Sauer, Carl O.. The Early Spanish Main. Berkeley and Los Angeles: University of California Press 1969. Tibesar, Antonine S. “The Franciscan Province of the Holy Cross of Española,” The Americas 13:4(1957):377-389. Wilson, Samuel M. The Indigenous People of the Caribbean. Gainesville: University of Florida Press 1997.